This home provides a very functional split-floor plan, an open kitchen layout with plenty of counter space for a growing family and a bonus room!. This plan features an expansive master bedroom / bath with a trayed ceiling and plenty of storage space in his and her walk-in closets. The large great room also includes a trayed ceiling and a gas log fireplace. Front and rear covered porches make the evenings enjoyable. This home is a great value with a wide variety of innovative features. Make this your home today! Question: Is there a point to the column between the kitchen and the great room. Answer: Hello, The interior columns could all be deleted easily onsite by the builder. Thanks. Question: Do you have this plan with a basement? 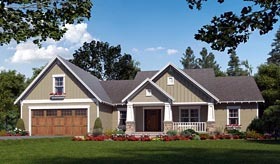 What would it cost to modify to have a 3 car garage?